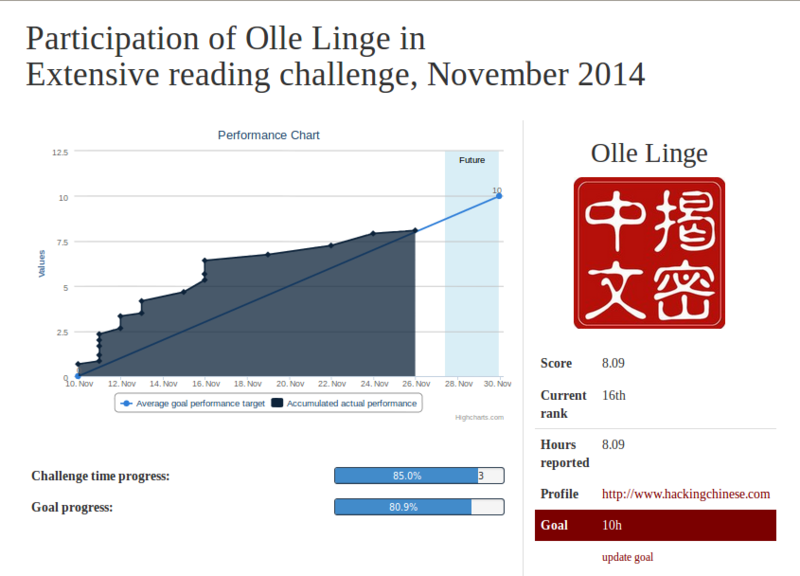 This month’s reading challenge has run for more than two weeks now and my progress report is late. I have moved house and spent most of my time carting boxes around and sort through the mess. This is not an ideal environment either for reading Chinese or writing articles on Hacking Chinese. Still, I want to write a bit about my reading challenge so far and I’m also curious to hear how you’ve done. There are still four days left, so if you haven’t reached your goal yet, you still have almost 100 hours to play with! If you want to know more about Hacking Chinese Challenges, you can either go there directly or read this introductory article! Next month’s challenge is going to be translation, so even if you still have things to read, you can sign up now if you want to. 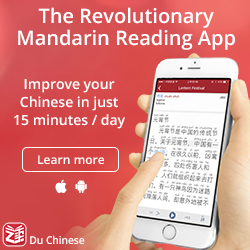 If you have trouble getting yourself to read as much as you said you would, don’t forget to read last week’s article about finding more time to read Chinese! I have of course written much more about time management in particular, so check that category for more information and inspiration! 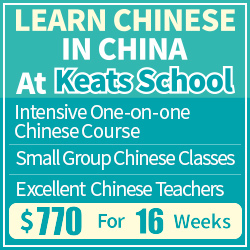 I knew that I would be busy this month, so I set a modest goal of reading ten hours of Chinese. 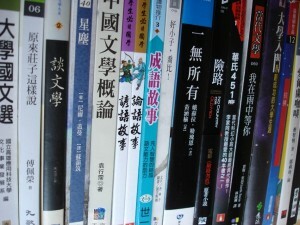 I’ve so far ready mostly on my e-reader (I have a Kobo, but I don’t really recommend it for others who’re going to use it mostly for reading Chinese since it doesn’t have a native Chinese dictionary), but I’ve also read random articles online and continued reading paperback novels. 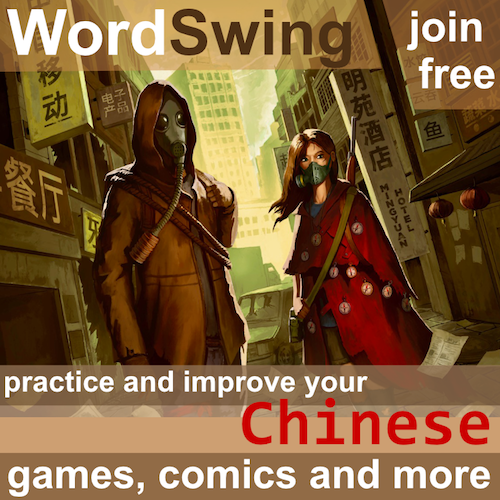 黃金時代 by 王小波 – This is a novel in three parts and I stopped reading after the first book. The language is relatively straightforward, but I must admit I don’t understand why this book is famous. It felt much like a juvenile adventure book set in the countryside during the cultural revolution. The characters were moderately interesting, but neither the setting nor the plot caught my fancy. If you have read this book and feel like explaining why it’s good, please leave a comment! 天空之火 (The Fires of Heaven) by Robert Jordan – As I have mentioned elsewhere, I’m trying to complete a project where I read the first real book series I started reading in English more than 15 years ago, but now in Chinese. I started reading The Wheel of Time in Swedish when I was twelve or so, then switched to English because the translator was too slow, then stopped reading in English because the author was too slow. This is the fifth book in the series. I’m not sure if I will be able to finish on time or not, considering that I have amassed a huge backlog of other things I should have done. Still, it would only entail half an hour’s reading for the rest of the week, so it shouldn’t be impossible! Controlling the environment is key I think, I will probably read enough just by strategically placing Chinese reading material in our new apartment and getting rid of the English I’m tempted to read instead. I should probably download some texts to my phone as well, even if I do have my e-reader around most of the time. Enough about me, how about you? What was your goal and how has the challenge been for you so far? There are now 110 participants in the challenge and even though I can view your progress on the leader board, it would be great to hear what you think about the challenge so far. Please also include what you have read and a brief introduction to it so that other readers can find reading material by browsing the comments. Reading preferences are of course very personal, but following other learners’ recommendations is still better than randomly guessing at what to read next! This challenge has made a huge difference to me. I’ve read 123 pages of 一九八四 this month, which is far more than I had expected to read, and it’s because I’ve been able to use Hacking Chinese to watch and boost my progress. I now plan to finish this 309-page book—my first proper, adult Chinese book—by the end of the year, and I really think I can do it, despite all the words I’ve never seen before. It’s been fun, and it feels like I’ve really achieved something special. Although not very faithful about posting about my progress, this challenge has motivated me to read 那些年，我們一起追的女孩 by 九把刀, I am a quite slow reader by my own standards so although I have clocked about 13 hours so far (within the challenge), I have only read about 90 pages. 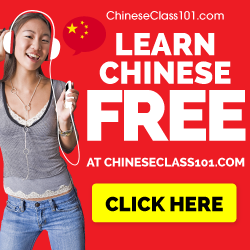 It’s really highlighted some of my prime problems I have had with learning Chinese – I always want to know every word inside and out, and that is just not realistic at this stage. I have amassed quite a lot of vocabulary which I like, although it is hard to transfer it from recognition to usage. This is a good book, though, because I enjoyed the movie and so I am interested in filling in the gaps by reading the book. I think that is a much easier transition than trying to understand overall plot on my first big book. I found I vastly overestimated my capability, haha. The Challenge has been fun. I consider myself a lower-level intermediate, somewhere between HSK 3 and HSK 4 and, teaching English, was able to borrow some of my young student’s children’s books. This and a few articles online were my target materials. I don’t think I could realistically read anything more difficult (maybe I’m underestimating myself.) I didn’t do a good job at all about posting my progress online, but I can definitely see that I’m starting to improve my reading ability.